The end of the school year is nearing and that can only mean one thing; the dreaded season of exams and summatives. This time of the year is nerve racking for everyone. Grade 12 students are praying they get into their first choice university. Grade 9 students are nervous to write their first exams, and Grade 10s and 11s are just trying to get by until summer vacation. Yes, the next few months may seem like the end of the world, but if you were able to get through December 21, 2012 then this should be a piece of cake for you. All you need are these five apps to help distress and make studying more fun. The Game of Life is an app based off of the “old school” board game. Travel along the game board and live a fun and exciting life all in the span of twenty minutes. This app is great for small breaks in between working hard on a summative or studying for an exam. You are able to live a fun and exciting life even if you are stuck inside completing a mountain high pile of work. Flow Free is a simple game of connecting matching coloured dots with pipes. Pair all the colours together and cover the entire grid to solve the puzzle. However, if you overlap pipes they will break. The best part of this app is the soothing water sound effects that play when pipes are connected. Let’s face it everyone loves taking selfies on their phones whether we can admit it or not. Catwang allows you to edit cats into those amazing selfies you have taken. Now this app may seem simple, but nothing is funnier than editing a cat on your face or a friend’s in times of stress. Word games are currently all the rage. 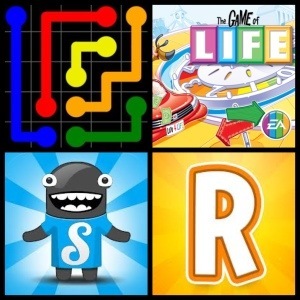 If you are tired of 4 Pics 1 Word, than Ruzzle is the perfect app for you. In Ruzzle the goal is to beat your opponent by finding more words than them in two minutes. Find words by swiping your finger across the screen and connecting letters. The letters must be touching in order to connect them. With rounds being only two minutes Ruzzle is a great energy booster in between work. Whether you use these apps, or others make sure to stay focused and finish the school year strong.